Despite its clown-like appearance, this Amazonian conehead katydid (genus Copiphora) is a formidable predator with powerful mandibles. 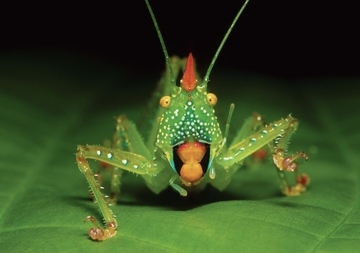 In addition to its diet of leaves, fruits, and seeds, it will hunt and devour large insects—including other katydids. But Copiphora also has its worries. To make its presence known to potential mates in the area, the male katydid makes loud rasping sounds with special structures on its wings. Unfortunately, these “calls” also attract the Amazon’s foliage-gleaning bats. Copiphora’s horn and leg spines may help deter bat predation.